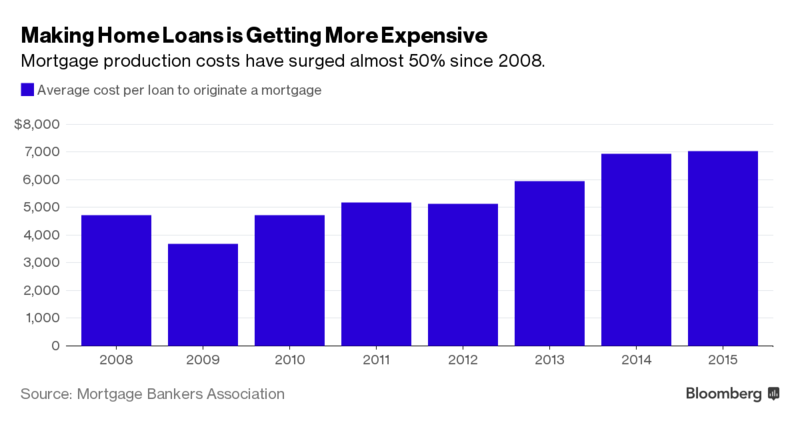 Here is a Bloomberg article about how onerous new regulations on mortgage originators. (HT: Confounded Interest). Because we have this terribly wrong idea that unregulated mortgage originators were the reason for the housing "bubble", even in 2016, we are still turning the screws on the industry. Here is a graph from the article. The picture I am putting together from the zip code level data is that lower credit constraints explain a surprisingly small part of the boom, but they explain all of the pain since the boom. Equity losses have been especially painful for homes in low income zip codes since 2006. They have lost more than they ever gained, relative to other neighborhoods. You can find hundreds of articles pointing out that the boom and bust was hardest on minorities, or the poor, or whatever the photo-op social justice prop of the day is. Not a single one of those articles will suggest that maybe, you know, those poor folks could maybe be okay if there was a functioning credit market for them to access. No, credit is the problem. Social justice props can't be allowed to have their own agency. They can't handle it. Didn't you see what we all insist happened in 2005 when we let them manage their own finances before? By imposing these strict constraints on mortgage lending, we have imposed a depression on poor neighborhoods. Families are trapped in undervalued homes because there are few buyers, because we have decided that mortgages are the enemy. Here is a comparison of Closed Access (NYC, SF/SJ, LA, Boston, SD) and non-Closed Access city incomes and home prices since 1998. So, do you think, in the year 2013, the reason those low income houses in Closed Access cities have risen the most is because there is too much credit flowing into those neighborhoods? Is there some monetary theory that explains why QE money only flows to places where there is no legal way to invest in new shelter? Credit access does explain why houses have appreciated the least in low income zip codes in the other cities. We deprive them of houses where they live and now we deprive them of the funding that could build a house where they have to flee to. Politically imposed deprivation is everywhere, and the public reaction is to demand more. This is trillions of dollars worth of damage, imposed most harshly on the most marginal households, and it is being done with righteous indignation, near unanimous support, and a feeling that finally something is being done about those hobgoblins. Trillions of dollars. If we can do this much damage with public policies that are nearly universally supported, imagine how awful those policies are that some people actually disagree with. Or, maybe it is the unanimous stuff that is invariably the worst. In any case, the downside of public policies, especially those that remove opportunities and options for people - especially those built on ancient prejudices and juiced up attribution error, is much, much less than zero. Benign negligence is clearly, empirically, far from the worst public policy. Sure, neglect is nothing to be proud of, but it is a hell of a lot better than what everyone apparently is proud of. It would be one hell of a good first step. Benign neglect would be the best thing that has happened to working class neighborhoods in decades. We have a lot of solutions to overcome just to get back to square one. But, boy does square one look good from here. I just don't think the regulations sound that onerous. In my experience if there is money to be made lending to someone that void will be quickly filled by the market. If someone came to me with a great idea to lend to low income households who are shut-out of the mortgage market i'd run the other way. Truth is the income trajectory for this population just isnt good. I think you have the wrong culprit. There are many cities where houses at the low end are selling at Price/Rent ratios of 5. It is true that incomes and savings of low income households have been hurting. Lending and building houses will fix all of these things, in real terms. I'm no expert on the inner workings of the mortgage industry, but clearly there is a confluence of factors that are keeping banks from lending to reasonable households, and many of those are regulatory. Check out SoFi. Eventually they will expand their reach further and further. Equity financed banking staying out of certain states due to regulation. Interested to watch them grow. Yes, it is an interesting development. It may be our best hope. Democratizing banking. The reason it will help is because we will identify with the hobgoblins, and so we'll leave the pitchforks in the barn the next time we're out looking for scapegoats. Is a high price/rent ratio any different than a low P/E stock? I think not. It's the market's way of saying the future doesn't look great. These populations have poor income trajectories. Maybe. I suspect it has more to do with credit constraints limiting the buyer's market, more rental units in the vicinity, and lower ability to claim tax benefits of ownership. Does rent inflation run lower in low income neighborhoods? I'm not sure that it does. Did you see that Cerberus just exited the landlord business? The high rental yield looks like a "free lunch" but based on what I see in the market it is not. I'm no expert on pre-crisis industry norms, but it looks to me like the residential rental REITs have had high growth, good dividends and returns and high Price/Book values. I'm not sure that they are that great of an investment at this point, but they generally look to me like I would expect them to look. And the BEA says landlord profits are high. I think the only way to really get a huge personal payoff to this is to directly purchase low priced homes and be a landlord. I think a highly leveraged, diversified basket of low-priced single family rentals would probably provide a huge payoff with little risk. "Or, maybe it is the unanimous stuff that is invariably the worst." --Kevin E.
This may be true. I have been ranting about property zoning and the criminalization of push-cart vending. I can assure you, no one cares, or if they care, it is to prevent any laxing of zoning standards or anybody pushing a cart. Our nation universally embraces property-zoning and the criminalization of push-cart vending. Side note: A lot of people (in hindsight) have bashed lenders for cruddy mortgage underwriting standards pre-2008. But the other side of the story is that house prices in the US hitherto had never declined. Until 2008, it was safe to lend on housing. Sheesh, major rating agencies gave the thumbs up to mortgage-backed pools, which were bought by sophisticated investors. Not only that, pools of commercial mortgage-backed securities, were also sold. Yes, the Fed tightened so much that all these pools of mortgages, in the short-tun, mark to market, became less valuable. Both residential and commercial markets have recovered. Anybody buying property in 2009 made a killing. It's interesting how the fraudulent underwriting conclusion was pre-determined. A while back I linked to a report from 2007 where S&P downgraded a bunch of MBS. Even then, in the first rounds of the crisis, they were finding rising defaults, but they couldn't find a correlation between defaults and borrower characteristics. But, instead of wondering if the cause of defaults was something other than borrower statistics, they assumed that underwriting had suddenly gotten so bad, over the course of just a year or so, that suddenly, even quantitative inputs were so covered in fraud that it must be bad inputs that was preventing them from seeing what type of borrower was defaulting. What was really happening was that the first victims of the crisis were the Contagion cities, so new buyers in those cities were defaulting. Ironically, because the rating agencies misunderstood the cause of defaults, they ended up taking the blame for giving the securities high ratings in the first place. The seeds of that blame are actually planted by the ratings agencies themselves when they apply the downgrades. What puzzles me the most is the blatantly self-contradictory narratives that so many people come out with the moment they start talking about the housing crisis's impact on the poor or minorities. Mind you, these are the same people who have been arguing that the market hasn't offered these groups *enough* credit. They contend that banks disproportionate deny mortgages to minorities, and have made laws to prevent banks from avoiding low-income or minority areas; and yet, if banks really did irrationally avoid those groups, then they would have been largely protected from the very housing crisis they think happened. This is what really makes the Dodd-Frank bill and legislation like it so absurd to me, why I can't believe people who write legislation for a living could have passed it. It spins two opposing tales simultaneously. On one hand, evil banks are denying oppressed people loans, so some provisions make it easier for people to take action against banks for denial of loans or for too stringent terms; but then other provisions. On the other hand, evil banks are offering loans overly generously to oppressed people to exploit them, so other provisions make it easier for people to skirt their loans on the basis that the bank never should have given them out in the first place. So are banks cruelly denying service to the marginalized? Or cruelly cajoling them into accepting services they don't really want? Activists need to just pick a lane already. Yes. It's why I am curious how the book will be received. Somehow, I have been fortunate to have a very high quality readership here, that addresses the surprising empirical findings I am working through. But, I don't see how most people will be able to address my findings without a lot of cognitive dissonance, because their premise begins and ends with greedy, evil bankers that need to be fettered.